We get calls when opportunities or problems that keep coming up must finally really be addressed. Perhaps you don't have the internal time or expertise, or things have become more painful. Or you are contemplating a transaction. Or you are just tired of seeing the opportunities slip by and keep showing up on your to-do list. Whether marketing, sales, business development/expansion or planning and the accompanying operational issues, if they are sticky, we love to tackle them. Our clients often have untapped opportunities to generate revenue quickly that they either didn't have the time or people to address or they just didn't see. Capitalizing on this low-hanging fruit in the sales and marketing arenas can often buy time to address the other opportunities that take longer to develop and incubate. While our clients are busy addressing the needs of existing businesses, product lines and customers and assuring the preservation of the business they fought hard to develop, we supplement their activities. Addressing opportunities and bringing our expertise to bear in helping improve their speed to market. Our activities run the gamut from launching new businesses to geographic, trade class or target audience expansion. Frequently our clients lack the internal expertise needed to solve a problem or capitalize on opportunities. Often they do not want to or cannot add overhead. So, we address a defined activity, for a defined result and time. Often carrying a business card as a senior member of our clients' management. Some clients faced an immediate need -- generally created by promotion, resignation, health related issues or peaks of activity -- until new senior management could be hired or the company sold. 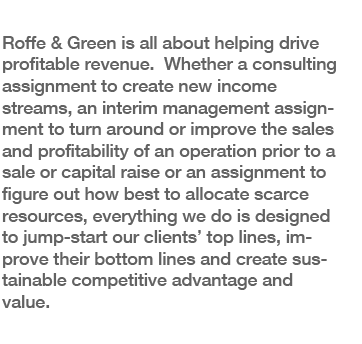 Or assignments were dictated by the need to capitalize on opportunities or improve operations prior to a sale or capital raise. And sometimes clients needed help defining the characteristics required for a successful candidate. Working all over the U.S., Canada, Europe and Asia, from two days a week to seven, we have been transplanted and we have commuted, depending on what is best for the business. Our assignments as C-level interim managers (generally CEO, COO, or head of marketing, sales or business development) have lasted between 6 and 27 months. And, when done, we assure a smooth transition and turn the business back in better condition than when we received it. Harness the power of third parties to accelerate growth. Sometimes the best strategy is to align yourselves with one or more third-parties, to take advantage of their strengths and minimize your weaknesses. Just as acquisitions have a high failure rate in terms of successful integration of two companies and two cultures, so too with alliances, be they licensing, distribution or other sorts. Both (or more) partners give up some control, some power and some revenue, and all need to begin with a reasonable set of objectives and expectations. Like marriages, there has to be negotiation, mutual respect and compatibility, recognizing that the partners bring different assets to the alliance. These issues become particularly acute as you cross national borders. Creating international alliances, licensing, finding distributors internationally and other opportunities simply magnify the challenges, and require a clear strategy and firm hand to succeed. We understand these issues, and have successfully brought partners together for years.